Peter Cullen, the voice of Optimus Prime, confirms his presence in the Bumblebee movie. Get a look at Tom Holland and Daisy Ridley in action together for the Chaos Walking movie. Plus, celebrate the return of the CW/DC shows with fast food ads, and what’s to come on Star Trek: Discovery. Spoilers now! 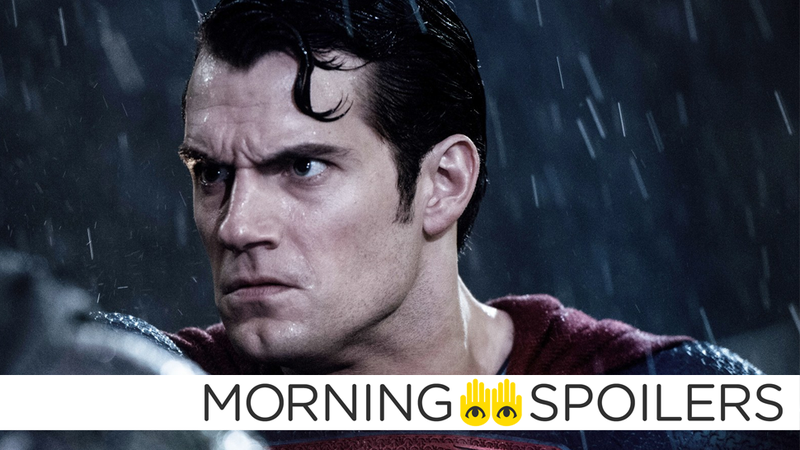 Yes, it’s time for the internet to get itself flustered over more Superman merchandise talk. This time it’sa baseball cap that allegedly confirms that Superman will indeed return wearing the black supersuit he wears in The Death and Return of Superman. I wasn’t involved with Joss at all, (he was here for) some of the reshoots and I wasn’t involved in that. But I think he’s really dedicated to finishing the story that Zack was telling. Again, that’s my understanding from my vantage point. Peter Cullen has confirmed he’s recording voiceover work for Bumblebee. Whether this this means you can expect another appearance from Optimus Prime, or if he’s participating in another capacity (narrator?) remains ambiguous. In an interview with Coming Soon, producer Jason Blum discussed why he believes Todd McFarlane is the perfect person to adapt his own source material. I think he’s gonna do a great job. Being a director encompasses a lot of different skills, but one of the most important skills is you have to be a great manager. You’re kind of a General of this army that you have to lead into battle every day, and he does that in his life every day running McFarlane Enterprises. So I think that translates to directing in a lot of ways. We’ve had a great back-and-forth around developing the script. I wouldn’t have done it if I didn’t think he could do a great job, but we’ll see. I have a good feeling about it. Kaya Scodelario confirmed to ScreenRant she’s contractually obligated to appear in a sixth Pirates film, but hasn’t “heard anything” just yet. Well, when I signed up for the first one, I signed up for two movies. So I am contractually obliged, but I’d love to [do it]. I think there’s a lot we can still do. I’d like see a Carina who takes the helm of Barbossa on the sea – have her own all-female pirate crew. Daisy Ridley shared the first official image from filming on her Facebook page. Hulk’s mere presence scares the crap out of Loki in a new TV spot. Marvel (through IGN) has released special New York Comic-Con posters for four of their upcoming shows, confirming that Jessica Jones’ second season is on the way in 2018. DC All Access spoke to Tom Welling and the cast of Lucifer about the new season. A motion poster from the show’s official Twitter seems to depict Frank Castle trapped in some hellish pocket dimension he cannot escape. The CW has released a commercial for DC’s fictitious fast food chain, Big Belly Burger, advertising the upcoming return of its CW/DC shows and reminding us all of the thin narrative constraint that all these stunningly fit and attractive characters seemingly eat nothing but fast food burgers.